The Venue SUV is Hyundai’s answer to Mahindra XUV300, Maruti Suzuki Vitara Brezza and Tata Nexon but gains over competition as the ‘first smart connected SUV’. 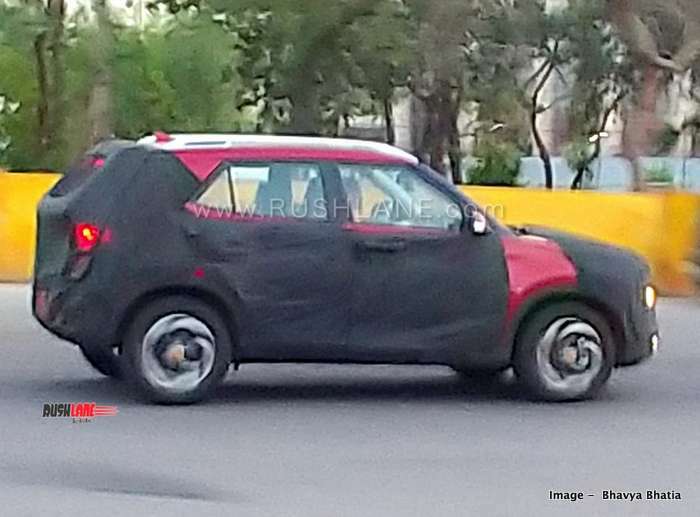 Hat tip to automotive enthusiast Bhavya Bhatia for sharing the spy photos and video. Hyundai India is ready to showcase the new Venue SUV on 17th April. The SUV was recently on test by automotive enthusiast Bhavya Bhatia, drawing attention to its exterior design, especially the side view. There is no doubt that the Venue SUV looks very similar to the Creta from side. In the front, it carries forward Hyundai’s cascading grille which is flanked by headlamps in a similar design to that seen on the new Kona. Other exterior design elements include a two tier headlamp unit with projector headlamps and LED DRLs, body cladding, roof rails, etc. Features to the rear include square shaped LED tail lamps. The Hyundai Venue sits on diamond cut alloy wheels. Engine specifications in the soon to be launched Hyundai Venue would include an all new 1 liter turbo petrol engine with 7 speed DCT gearbox. It will also get 1.4 liter petrol and 1.4 liter diesel engine from Verna. Where on-board safety features are concerned, the Venue will be seen with dual front airbags, rear parking sensors, ABS and seat belt reminders which will be offered across range. Hyundai claims that the Venue will be ‘the first smart connected SUV’. Its global model will debut with 33 connected features with 10 India specific ones. Called as Hyundai’s BlueLink Connected technology, these will include Safety, Convenience, Connected and Vehicle Relationship Management. These connected features would have a team of 615 Blue Link Wizards, who would be imparting training to over 10,000 sales consultants at the company’s dealerships to explain the features in detail to buyers. Hyundai will also install Blue Link Simulation app at all dealerships which would allow customers to get a better connected car experience. Hyundai’s BlueLink Connected technology will sport a tamper proof eSIM which will be offered by Vodafone Idea and a cloud based voice recognition platform from Global AI Company. This will ensure real time traffic navigation, live local search, panic and medical assistance, geo fencing and stolen vehicle notification. After Venue, other Hyundai cars will also get these new features. Hyundai Venue will be priced from Rs.8 to 12 lakhs, ex-sh. It will rival Maruti Brezza, Ford EcoSport, Mahindra XUV300 and Tata Nexon in India.